Southern California Fires Surpass 140,000 Acres As Santa Ana Winds Drive Flames : The Two-Way One fire official says he foresees a fight that could last weeks. 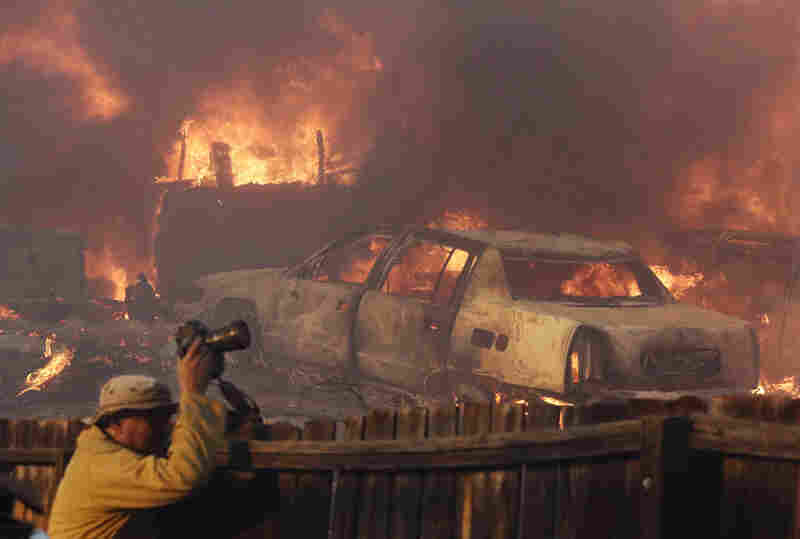 The weather trends that favor wildfires could be around a lot longer than that. 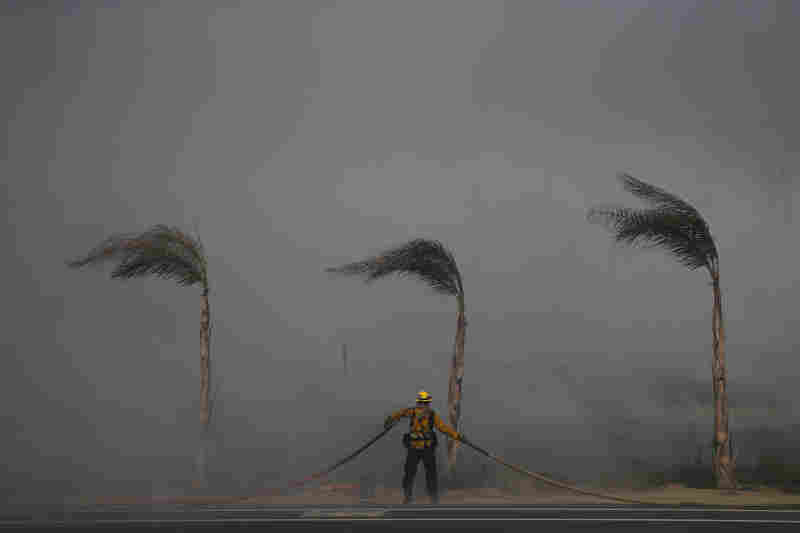 A firefighter battles a wildfire on Thursday at Faria State Beach in Ventura, Calif.
Flames consume a home as a wildfire burns in Ojai, Calif.
Palm trees sway in a gust of wind as a firefighter carries a water hose while battling a wildfire at Faria State Beach in Ventura, Calif. Firefighters monitor a section of the Thomas Fire along the 101 freeway north of Ventura. 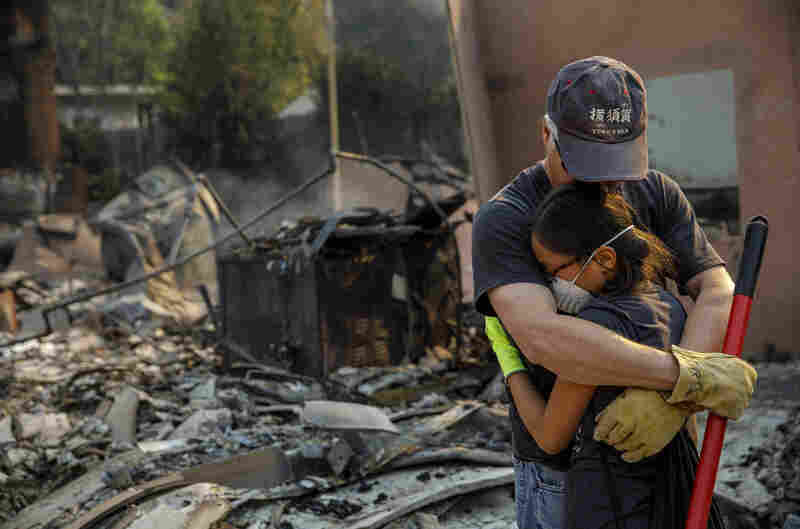 A firefighting helicopter makes a water drop at the Thomas Fire near Fillmore, Calif.
Jeff Lipscomb comforts his daughter Rachel Lipscomb, 11, as they survey their destroyed Ventura home. John Bain and Brandon Baker take cover from the embers as they try to help stop a fire from burning a stranger's home in Ventura. 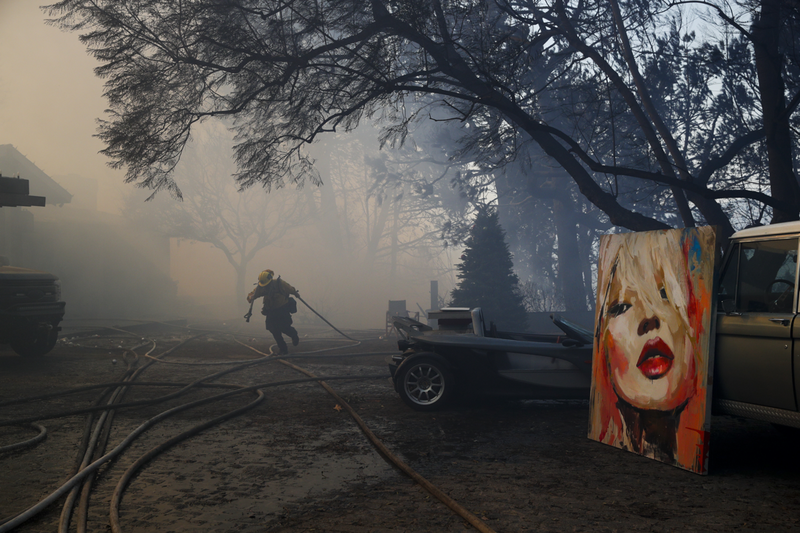 A firefighter carries a water hose as a large painting saved from a wildfire is propped against an SUV in the Bel Air district of Los Angeles. A photographer takes pictures in the Lake View Terrace area of Los Angeles on Tuesday. Motorists on Highway 101 watch flames from the Thomas fire leap above the roadway north of Ventura on Wednesday. Carolyn Potter throws dirt on her fence along Nye Road in an effort to save her house from the Thomas Fire in Casita Springs on Tuesday. 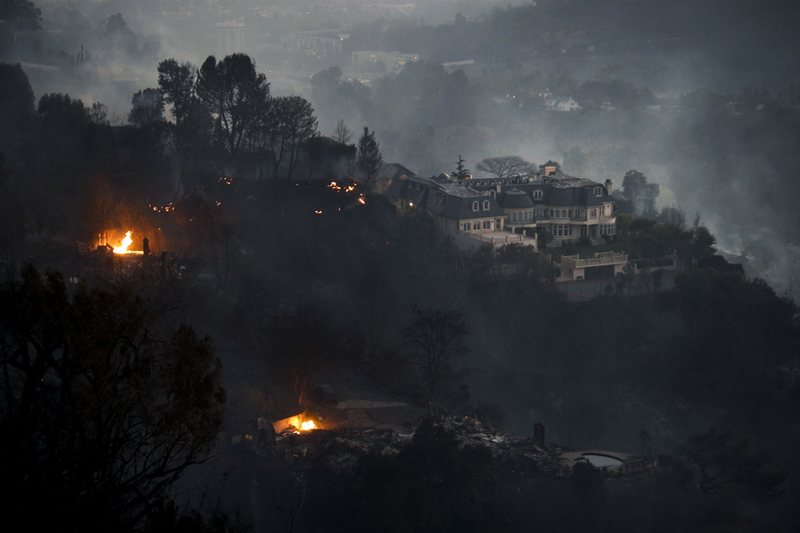 A mansion that survived a wildfire sits on a hilltop in the Bel Air district of Los Angeles after a dangerous new wildfire erupted in the area and across Southern California. 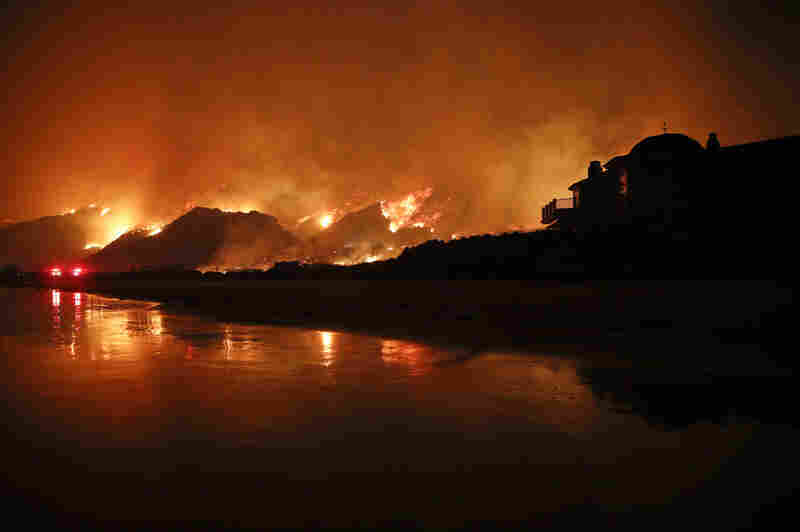 A wildfire burns along the 101 Freeway on Tuesday, in Ventura, Calif.
An end to the threat is still a long way away. The National Weather Service office in Los Angeles and Oxnard says it expects critical fire weather conditions to linger into Saturday. 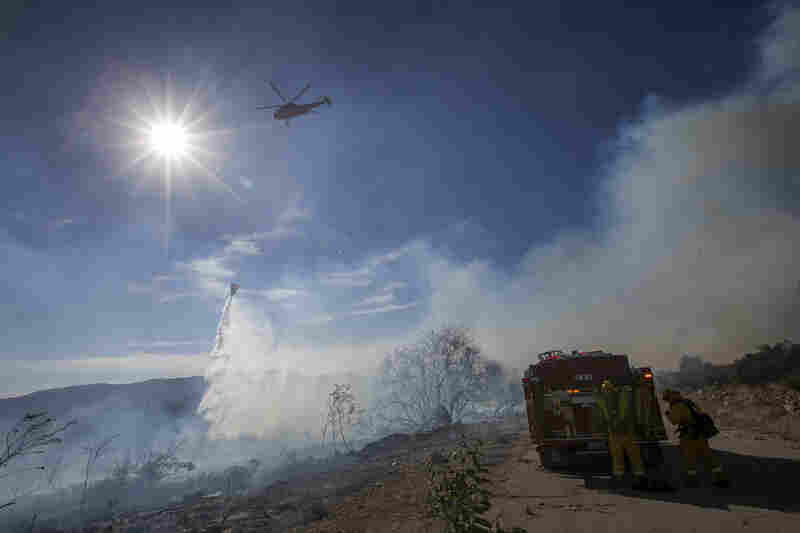 As NPR's Kirk Siegler reported on "All Things Considered," the combination of hot winds and fast-moving fires may be part of a "new normal" in Southern California. 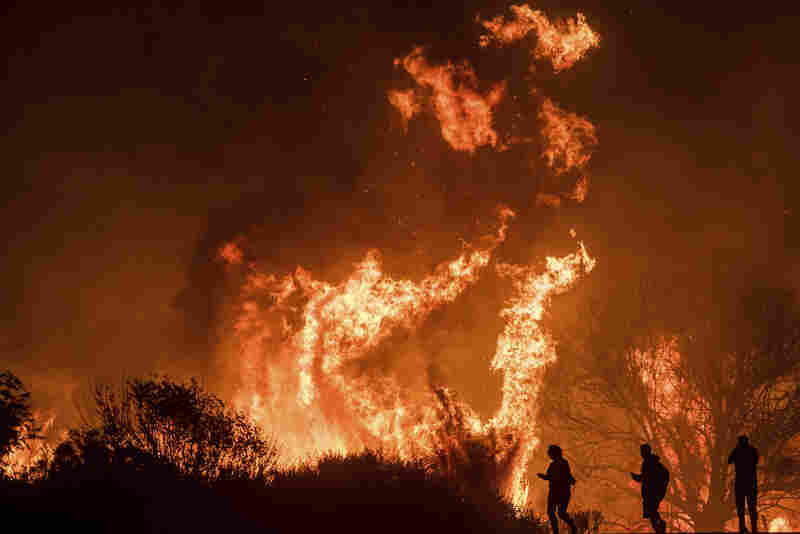 "The immediate culprit of the five major fires burning in Southern California right now is the Santa Ana winds: the hurricane-force gusts that blow off the Mojave desert, igniting infernos from toppled power lines or carelessly tossed cigarette butts. "It's not unusual to get Santa Anas this late. It's just that by now the rainy season should have started. "There is also a high pressure ridge stuck out over the Pacific that's blocking storms. 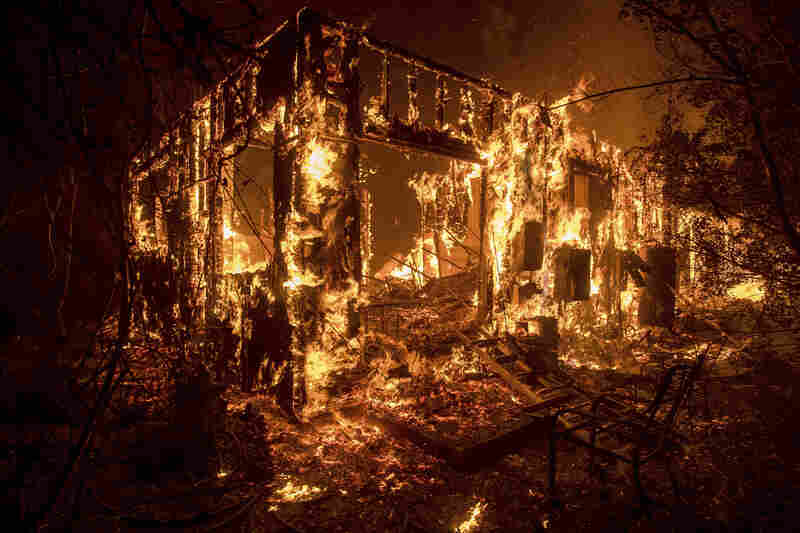 "Swain's research is showing that these high pressure systems are growing in frequency as a result of the warming Pacific ... one reason California is getting hotter and drier, with drier brush and longer fire seasons. "'It's starting to appear that the likelihood of seeing these sorts of events is increasing.'" 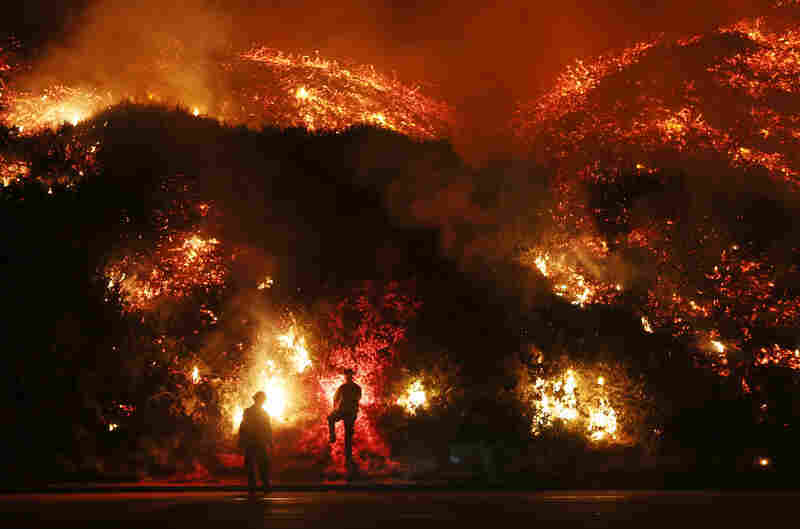 As The Associated Press notes, "The wilder winds could easily make new fires explode too, as one did Wednesday in Los Angeles' exclusive Bel-Air section, where a fire consumed multimillion-dollar houses that give the rich and famous sweeping views of Los Angeles." 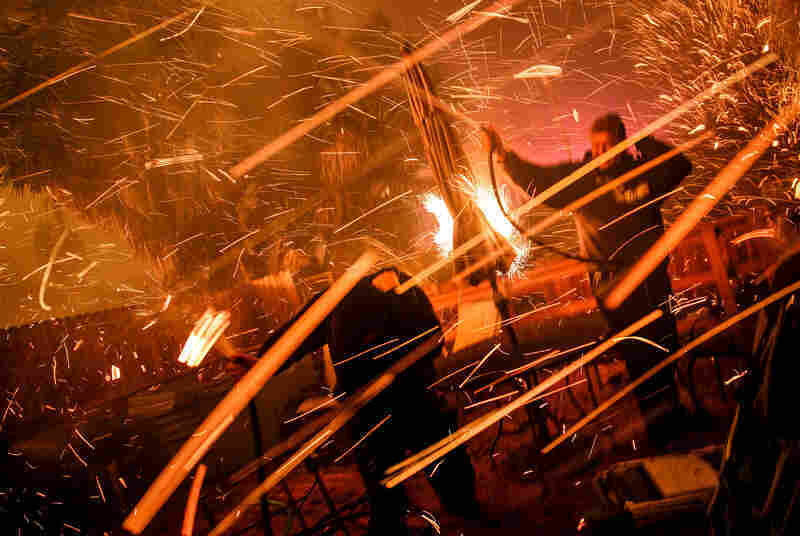 The fires have produced vivid and shocking images of massive walls of flame. But on Wednesday night, a much smaller scene of peril played out, when a man was seen getting out of his car to rescue a rabbit that was near perilous flames on Highway 1 in La Conchita. 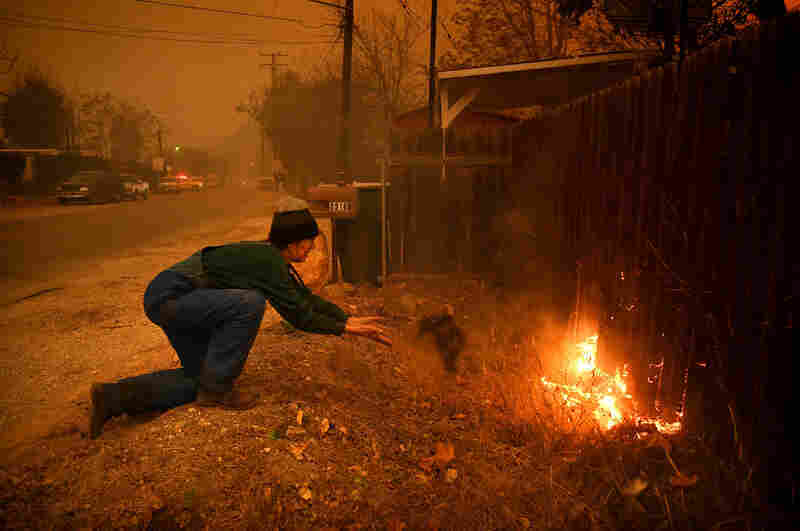 In a dramatic sequence captured by RMG News, the rabbit ran away from the man — and toward the flames — before he managed to corral it. He declined to be interviewed afterwards. Thousands of people have been placed under evacuation orders. And making the situation more dangerous for anyone trying to flee affected areas, the fires have forced closures on arterial roads. In addition to the brief shutdown of a stretch of the 101 on Thursday, a portion of the 405 freeway was closed in both directions for a time on Wednesday. 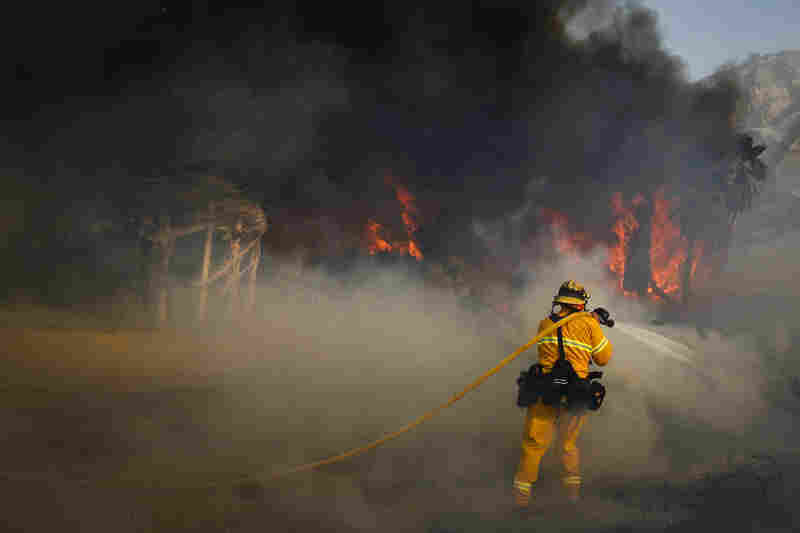 Mary Plummer, a reporter with member station KPCC in Pasadena, tells Morning Edition that "these fires are affecting a real range of geographic areas — some very urban, some very rural. So, it's a real logistical problem." Gov. Jerry Brown declared a state of emergency for Los Angeles and Ventura counties, which will free up state resources. Smoke and dust from the fires have also raised health concerns. "Air quality reached 'hazardous' levels in Santa Barbara Thursday,' KPCC reports, citing the Santa Barbara County Air Pollution Control District. "An air monitoring station in Goleta recorded 'very unhealthy' levels, and in Lompoc, conditions were 'unhealthy.'" San Luis Obispo County says it was also being affected by the smoke, cautioning residents to reduce their exposure to smoke and ash.